Whatever their defects as historical analysis, [multiracial and multicultural] have become obligatory public gestures. Among breaches of propriety, defining race in ‘bipolar’ terms ranks well ahead of wearing animal fur. During a symposium at a university in southern California, a senior historian of white women rebuked me for emphasizing the historical origin of American racial ideology in the enslavement of Afro-Americans–not, apparently, because she judged the argument invalid, but because she thought it unseemly to make in California. In Racial Propositions, HoSang charts the trajectory of ballot initiatives from the 1946 defeat of Prop 11 – which sought to create a state Fair Employment Practices Commission that would police racial discrimination by unions and employers – to the first ballot initiative victory by civil rights advocates in 2003 – a rejection of Ward Connerly’s Prop 54 attempt to ban state and local governments from compiling racial data. For much of the book, HoSang recounts how civil rights advocates continually foundered in their attempts to pass ballot initiatives in their favor and reject those to their detriment. Moreover, HoSang reveals the odd discourse that emerged. Paradoxically, ballot initiatives with clear racial impacts were increasingly discussed, promoted, or critiqued in language that avoided nearly all mention of race. In the defeat of 2003’s Prop 54, civil rights advocates and others constructed a successful opposition campaign by focusing on the proposition’s impact on health professionals and services eschewing all mention of race. The larger theme coursing through Racial Propositions relates to this central issue: racial liberalism and the idea of tolerance rested on a foundation of racial logic that reduced racism to a disreputable personal act attached to individuals rather than the institutional variant that remains pervasive today. In this constellation of race, debate regarding discrimination becomes increasingly difficult as civil rights proponents continually found themselves on their heels politically in attempts to appeal to the mythical white suburban voter who no longer saw a society stratified by racial divisions. So what exactly does HoSang mean when he employs the term “political whiteness”? HoSang’s definition parallels similar arguments regarding debates about masculinity. For example, many scholars argue that a “heteronormative gaze” has functioned to establish an accepted discourse regarding sexuality, stressing monogamy and male dominated heterosexuality while marginalizing those who inhabit sexualities outside of this public sphere. This results not only in a marginalized identity but a liminal or nearly invisible figure. Historians like George Chauncey have illustrated the complexities of early 20th century sexuality where a burgeoning lexicon attempted to create a public space, admittedly encoded, for what observers today would describe as homosexuality. However, though homosexuals successfully constructed a veiled public life, certain concepts like gay marriage remained not only unspoken, but non-existent. For example, in City Boy, literary critic Edmund White notes that despite the proliferation of gay rights movements, none of White’s peers ever considered matrimony: “Back then we had no notion of ‘gay marriage,’ partly because may of us were equally opposed to marriage for straight people.” (99) Perhaps White’s sample group—bohemians and others who fancied themselves avant garde—was a bit skewed. One could also suggest, as White does, that the broader society had begun to question the validity of marriage or at the very least aspects of it. Clearly, as White articulates and Josh Sides has illustrated, in its early stages after decades of closeted or encoded behavior, the gay liberation movement saw open sexuality and expressions of this sexuality as a political right to be deployed. Yet, few gays pressed for marriage rights. Perhaps, marriage seemed like a cage to the newly out gay community. Then again, it might also be because the idea itself, squashed by heterosexual norms, could never emerge. The rules and limits of discourse, set by a dominant heteronormative society, would not allow it. Breeders viewed such ideas as so impossible as to elicit comedic disbelief. White admits that this discourse impacted gay men psychologically. “We ourselves still thought it was pretty strange being gay, and half the time we were claiming our gay rights we were really whistling in the dark,” reflects White, “trying to convince ourselves we weren’t really public menaces or monsters either pitiable or frightening.” (99) HoSang’s political whiteness parallels this “heternormative gaze”—each dictates the terms of debate and marginalizes or obscures those who fail to reside within its boundaries. Moreover, the discourse of racial moderation viewed integration as required by law, but not necessarily morally correct; in this way it failed to address the underlying tensions that created segregation. Charlotte Brooks found similar developments in the integration of Los Angeles and San Francisco by Asians and Asian Americans. Brooks points out that many whites “accommodated racial change in ways that preserved their racialized self esteem.” (Alien Neighbors, Foreign Friends, 221) Though many white residents viewed the presence of Asians as a drag on property values, they justified integration by commending Japanese and Chinese families for their “values.” “As Asian Americans gained greater access to formerly all white areas,” writes Brooks, “a growing number of white Californians began to speak of them as people who shared the kinds of values that whites usually identified exclusively with themselves and their neighborhoods.” (221) Moreover, whites explained that American treatment of Asians and Asian Americans had Cold War implications as domestic America could provide a transnational example promoting the nation’s tolerance of minorities. According to Brooks, California homeowners viewed integration as a sacrifice they must bear for a larger purpose: Cold War efforts in Asia. Still this allegiance to whiteness had boundaries. In White Flight: Atlanta and the Making of Modern Conservatism, Kevin Kruse explores the role class played in Atlanta’s white community during mid twentieth century desegregation efforts. When HoSang identifies the language of “political whiteness” as a collective “our [insert noun]”, Kruse illustrates a similar process in Atlanta. “For local Atlanta white communities, the language of community, community protection, and freedom of association,” notes Kruse, “became buzzwords for resistance. Initial resistance focused on constructing an “established white community” then using the language of community protection to prevent integration. Yet, as in Lassiter’s account of suburban school desegregation, class intervened as working class whites watched middle class families move to the suburbs, accelerating black encroachment into their neighborhoods. Of course, even within the Atlanta white middle class, divisions emerged. Local groups such as Help Our Public Education (HOPE) or Metropolitan Association for Segregation Education (MASE) formed in response to differences arising among whites resistant to integration. For many HOPE became “the unofficial voice of official Atlanta on the topic of open schools,” Kruse notes. 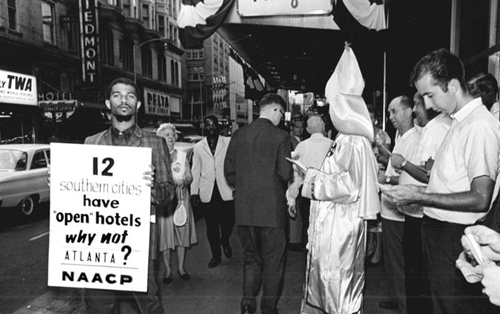 “The Hartsfield coalition and its allies in the press portrayed HOPE as the voice of the respectable middle class and dismissed segregationists as uncultured rabble rousers.” (138) Conversely, MASE represented a more militant strain of this middle class orientation that politely rejected black requests for inclusion. Draped in respectability, their leadership “spoke softly, with reserve and intelligence and in a language that accentuated middle class ideals of family, individual rights, equal opportunity, and upward mobility through hard work.” (140) The division between HOPE and MASE illustrated the fractured nature of middle class identities, but was also characterized by the kind of political whiteness rhetoric that HoSang explores: a rhetoric that clothed itself in middle class respectability, individualism, and race neutral language. To be fair, one could argue that the “values” Brookes, Lassiter, and Kruse point to relate as much to bourgeois class based sensibilities as much as whiteness or some combination of race/class intervention rather than “political whiteness.” Ultimately, HoSang’s sharpest critics will no doubt raise these complaints.As evidenced by these examples, the negation of race through a color blind rhetoric employed during ballot initiatives and school desegregation debates has become a defining characteristic of post war American public discourse. However, HoSang observes California’s ballot initiatives through a different lens. Ballot initiatives also reveal a compelling dynamic about political whiteness: the appropriation of civil rights rhetoric by often conservative forces. For example, in the battle over the passage of Prop 14 (this measure sought to defang the Rumford housing act, which more or less promised open housing), the California Real Estate Association (CREA) painted open housing acts like Rumford as intrusions on long held political freedoms. 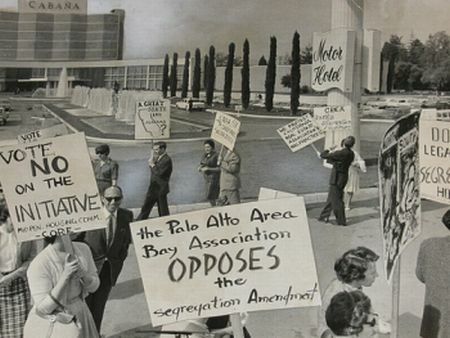 “Situating Proposition 14 in the spirit of an inclusionary Americanism built upon freedom and opportunity over exclusion and hierarchy,” HoSang points out, “the CREA’s Property Owners Bill of Rights asserted that Proposition 14 was indeed the rightful heir to the nation’s history of pluralist inclusion.” (68) However, the right that such organizations and those that supported them fought for was one couched in racial context. Race may have never been mentioned but as HoSang suggests, Prop 14’s protection gave whites the “right to discriminate against and exclude people of color in general and black peoples in particular.” (70) Even when articulated in terms of individualism and property, these ideas “referenced particular historical constructions and narratives,” writes HoSang. After all, if property rights proved to be the real issue, HoSang astutely points out that racial covenants, corporate agreements, and homeowners associations long circumscribed property rights through their racial restrictions. Instead, opposition to laws like the Rumford Act turned logic on its head, as developers and homeowners claimed its provisions illustrated that racial liberalism had run amok. In this context, homeownership became a social and political identity fueled by race, class, and gender normatives. This identity did not remain confined to proposition debates; instead as Eric Avila has argued, it pervaded popular culture. In Popular Culture in the Age of White Flight: Fear and Fantasy in Suburban Los Angeles, Avila pursues a task similar to that of William Deverall in Whitewashed Adobe, exploring the construction of a “privatized, consumer oriented subjectivity premised upon patriarchy, whiteness and suburban home ownership.” As government policies attempted to reconstruct American identities along consumerist lines, white suburbanites attempted to build a “classless” ideal that separated them from the “darkened” inner city. For example, the post war decline of neighborhoods like Boyle Heights and Watts, a decline due in great part to HOLC/FHA policies, and the rise of suburban enclaves like South Gate meant suburban residents hoped to differentiate themselves from the evils of urban living. Thus, as “the expansion of suburban California provided a mythic space for the construction of a new ‘white city’,” Bunker Hill, Boyle Heights, and Watts provided convenient straw men for the emerging “cinematic vision of a black and alien Los Angeles.” Here Avila juxtaposes the portrayal of the inner city in Los Angeles film noir with the rise of Disneyland, each representing an idealized/demonized version of metropolitan regions. Undoubtedly, Los Angeles’ role as cultural producer influenced such developments. The suburban, decentralized nature of Southern California, when portrayed in movies, television, and via Disneyland reinforced such conceptions of post war America. Throughout Racial Propositions, HoSang acknowledges the mistakes of civil rights advocates. Few organizations could claim experience with direct democracy electoral politics. Repeatedly, organizers made the same mistakes. First, too often, civil rights and related advocates mobilized too late, allowing opponents to dictate the terms of debate. Second, direct contact approaches rather than public events that frequently drew those already in agreement proved more effective in gaining support. Thirdly, and perhaps most importantly, never mention race. Here HoSang presents a provocative and some might argue polarizing argument: civil rights advocates and others ended up reproducing normatives through their method of opposition. 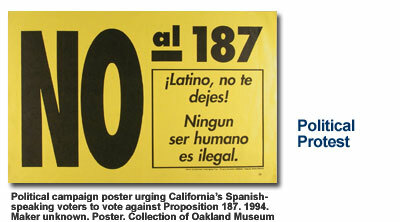 Opponents of Proposition 187 (1994 – declares undocumented immigrants ineligible for public, social, and health services, public education) and Proposition 209 (1996 – ends affirmative action in public hiring, contracting, and public education) adopted a campaign message in which they openly admitted that they agreed that affirmative action and immigration were problems but that the propositions’ solutions would only exacerbate each issue. Thus, though their intentions remained pure, their efforts furthered the underlying message of those who supported the propositions. HoSang points out that in regard to immigration reform, it failed to dominate concerns in California or nationally, but that the passage of Prop 187 and the debate that emerged in connection with it established a discourse around immigrants the served as dress rehearsal for the more polarizing, demonizing immigration controversies of recent years. As noted earlier, conservatives do not monopolize the concept of political whiteness. HoSang identifies the left or mainstream left’s role in perpetuating the very political whiteness that conservatives embraced. In relation to Proposition 187, HoSang argues Democrats did as much damage as Republicans. “While leading Democrats did not endorse Proposition 187,” he argues, “they fully participated in constructing unauthorized immigration as a political and economic crisis that required uncompromising action, essentially affirming the rationale that fueled Proposition 187.” (187) Take the example of Senator Diane Feinstein. The California Senator may have had more compassionate reasons for her concern regarding undocumented residents, but her prescriptions, like those of other prominent Democrats including Barbara Boxer and President Clinton, adopted many of the solutions from New Right figures. “Feinstein insisted that she was raising the issue in order ‘to avoid a serious backlash against all immigrants’ and to forestall more extreme proposals emanating from the ‘far right’,” observes HoSang. “But her policy prescriptions were largely taken from these same groups – her solutions mirrored those made by Pat Buchanan just one year earlier – and focused almost entirely on punitive measures.” (172) In the case of both propositions, the debates that unfolded shaped the discourse and understandings attached to each. The man, the myth, the magic? 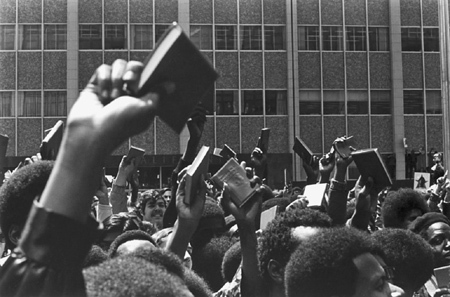 While critics may argue that actions matter more than discourse, HoSang’s examination of Prop. 209 illustrates the power of language to shape or influence voters. Proponents of the proposition labeled their movement the California Civil Rights Initiative. They argued that dismissing affirmative action fulfilled the 1964 Civil Rights Act’s provisions regarding gender and racial preferences. According to supporters, affirmative action programs promoted unqualified women and individuals of color while discriminating against hard working, better qualified citizens. Of course, this then stigmatized “any signs of Black advancement in education or employment as undeserved and unwarranted,” notes HoSang. This discourse also functioned to obscure the long history of preferential treatment for white men. The proposition passed rather easily yet exit polls suggested a paradoxical complexity. One exit poll found that 54% of voters supported affirmative action programs meant to help women and minorities find better employment and education. A second poll argued that as much as 80% of those individuals who voted yes on Prop 209 acknowledged that discrimination remained common. Whether these voters professed such opinions as a form of self therapy or had simply been confused by the rhetoric and language surrounding the proposition remains uncertain but clearly discourse helped to shape the final outcome in significant ways. If one accepts HoSang’s conclusions, California’s identity as the American multicultural capitol deserves serious revision. Granted, most observers acknowledge that discourse impacts actions, but to what extent? HoSang impressively charts how discourse can be employed to undergird real political change. Clearly, the language and legacy of civil rights battles no longer belonged to the left. Ward Connerly (Prop 227– ended bilingual education in public schools) utilized “claims to fairness, empowerment, and inclusion that justified support for programs like affirmative action and bilingual education could also be used to discredit them,” HoSang points out. (262) Nor was political whiteness property of whites alone. If HoSang illustrates this phenemona with examples so have other writers. The aforementioned M.D. Lassiter recounts the reaction by some middle class black homeowners in Charlotte to the suggestion of busing. Many Blacks openly resisted as one resident explained, “if I wanted my children to attend school with kids from the projects, I’d have moved next to one.” (218) Still, the question remains, is political whiteness really white or actually an amalgamation of class and race based sensibilities? HoSang effectively illustrates the dynamics of discourse and political movements that accompanied ballot initiatives. Undoubtedly, participants on both sides viewed race as a central issue, yet eventually all parties obscured its realities, thus relying on appeals to abstract ideals. Perhaps, the need to draw in wide ranging interests that traversed numerous classes, religions, ethnicities, and in some cases race, required this umbrella of whiteness. Apparently, political whiteness truly is a big tent — but one constructed by the white majority to house all those willing to abide by its rules. Next Decide Yourself if Radio’s Gonna Stay: A Post-Mortem of R.E.M.